The first league game of the season saw Dragons Ladies 1s take on newcomers to the East Premier division, City of Cambridge 2s. The game started strongly for the home team, who dominated most of the possession in the first 10 minutes. The backline dealt with a few early threats with relative ease, and displayed good patience in moving the ball around the back. The midfield and forwards worked hard in attack, and put the opposition under lots of pressure early on. This pressure payed off after 15 minutes, as Lou Murray surged into the D, winning a short corner for the Dragons. A slick routine saw newbie Katy Hands slot the ball home. A second goal from Hands came shortly after. Cambridge were not going to go down without a fight, and after a fumble of the ball in the Dragons defensive third, they had a 2 on 1 chance and calmly delivered, leaving the score 2-1 at half time. After some helpful half-time encouragement from vice-captain Liv Leary, the Dragons came out hard again in the second half. A great interception at the top of the D from Hayley Toleman saw her 1 on 1 with the keeper and she cooly put the Dragons another goal ahead. Soon after, some excellent defensive work from Liv Thomas and a perfectly executed pass from Toleman, put player of the match Stacey Lee in the position to show off her silky skills. These were polished off with the goal of the match – an airborne strike from a ridiculous angle, that somehow found the back of the net. Cambridge were not finished though, and after managing to pull back a couple of scrappy goals in the last 10 minutes, nerves were high in the Dragons camp. But some sensible, possession hockey saw them hold on to the 4-3 scoreline and walk away with the three points. The start of the new season saw a number of new faces in Dragons Ladies 2’s with only 5/6 of last years regular squad, in this weeks line-up. There were a number of league debuts, the team warmly welcoming Debs Painter to the Club, alongside Maddy Reynolds and Sophie Barrow who had moved up from last seasons Development League squad, a great achievement by them both. Arriving early at Gorleston, the team got out to warm up promptly, to get used to the different hockey playing surface. From the start Dragons took the game to Yarmouth, looking to move the ball as crisply as they could. The game was fairly open to start with, meaning Sarah Borrett, Karen O’Neill Simpson, Tash Falzon and Esme Potter needed to be alert and focussed, in order to snuff out any breaks and ensure Kristina Smyth had a relatively quiet early period of the game. Dragons passing was good and a break down the right saw Debs Painter, Kiera Goymour and Gail Thomas combine well to move the ball early to Hannah Hardy, who attacked the D, and passed the ball square to Maddy Reynolds who was perfectly placed to sweep the ball past the out-rushing keeper, to take the lead. An excellently taken first East League goal for Reynolds. Whilst Dragons continued to press in the first half, they couldn’t add to the scoreline and Yarmouth forced a couple of short corners where Kristina Smyth needed to be alert to keep out a deflection. Second half saw more of the same – Issy Wolfe was becoming more and more influential, with some great runs down either flanks. Charlotte Pounder was tireless in her closing down and support of the front line, whilst left and right mids Sophie Barrow and Kiera Goymour (joint PoM) were causing problems, particularly Goymour with her strong sweeps into the D, nearly being deflected into goal on a couple of occasions. Dragons forced many short corners, but they were simply not slick enough, and failed to make these opportunities count. Yarmouth Keeper Sophie McKinna was having an outstanding game. The Dragons press was working very well, being called by Painter and all were well disciplined in their jobs, constantly gaining turnover from the opposition. At times however Dragons were a little impatient on the ball or struggled to make their passing game work well enough on the sticky surface. In addition, they needed to be alert to Yarmouth’s counter attack, Kristina Smyth being forced into a couple of smart saves to help secure the points. The final whistle went with just the one goal separating the teams. Dragons will know the can and will need to play much better, but a wins a win! 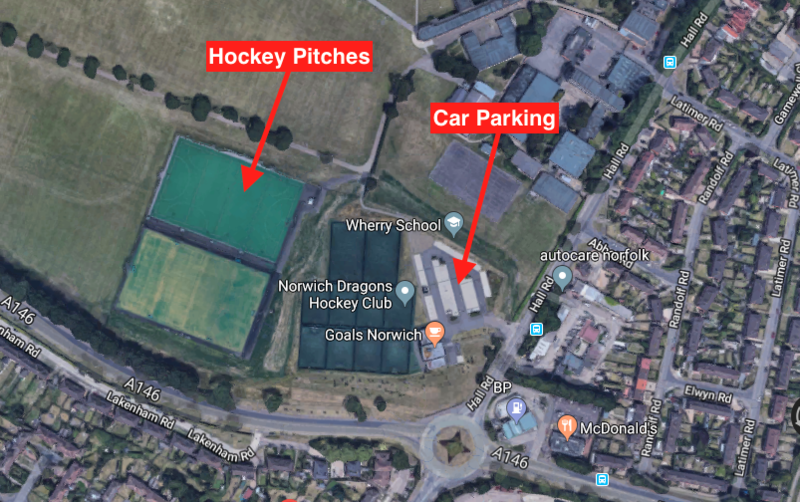 A competitive friendly game between Norwich Dragons 3rd and 5th teams started with positive attacking play by the 3rd team throughout the field. The first goal came early following a series of short passes up the field and was confidently completed by Ally with super stick skills. The second goal, again created by a sequence of passes culminating with Sam scoring from a courageous dive at the far post. More chances were created by the Dragons 3’s in the first half including hitting the post, but the score remained 2- 0 at half time. The second half started with the Dragons 5th team creating a couple of chances which were calmly dealt with by the defensive team of Luisa, Carmel, Kath and Spike. Dragons 3rd team remained patient and were soon rewarded by the third goal created down the left through Spike, Katie H, Lucy, Sam and calmly finished by Jess. The fourth goal again created from great team play by Hannah, Harriet, Katie M and completed by Sam for her second. The fifth goal this time beginning down the right side, starting with Carmel via Debs was again finished by Ally for her second goal of the game. The sixth goal was slipped over the line by Harriet from a short corner and the seventh goal skilfully completed by Debs linking with Katie H from another short corner. A good team performance to build on for the season ahead. MOM was Hannah Ellis for Ladies 3s and Ester Jacobs for the 5s. The Ladies 4’s trooped off to Taverham for an afternoon game in the sunshine. Looking at the stats City 4s had been beaten by City 3s the previous week by 10-0. City had first push back and off we set. The ball went end to end as we settled into the first 10 minutes of the game. Lynne Price passed the ball out wide to Aditi Naik, Sue Cross running out wide into space picked up the ball and ran it into the D. Sue’s strike rebounded off a defender and a long given. Caroline Wolfe and Gina Hunt hovering around in the D waiting ready for a goal or rebound, slotted in by Lynne and cleared by City defence. Vicki Earley was working tirelessly at bottom of the diamond to cut off any advance from City and creating an option in the centre. In the first half as Bridge Le Good would say we couldn’t seem to hit a barn door, with several chances and managing to convert none. There was some nice triangular play up the wings between Lynne, Lucy Buxton, Trish Hagan and Aditi. Sarah Wagstaff deftly picked off any City play into the D and got us out of tight spots at the back. Passing the ball out wide right to Jemima Williams who passed it on quickly up the wing. Both Jemima, Georgia Butterworth and Ella Kassulke worked hard to stop forward movement from City who at times came fast and many. Solid Kat Speirs was called into action as keeper many times with a good range of kicking and stick stops. Unfortunately City caught us on the hop in the second half and scored twice, not looking like a team that got beat 10-0. At times we were skilfully moving the ball and looked great but some things to work on for next time, converting those missed goals. Ladies 6 knew Herlings would be a tough opposition. Playing their home hockey on grass, they are known for their hard direct strikes of the dead ball and gutsy determination. BUT Dragons were ready for the fight! Still waiting for squads to settle, there were several new faces to the 6s this week – all adding to the strength and depth of the squad. Winning the first push dragons started hard with Coach Jason on the sideline, playing some beautiful hockey. Anita Mancini working hard in the top of the diamond position distributed some lovely wide balls to Harriet Rant who used 1 on 1 skill to get some fantastic crosses across the face of goal. The mid-field worked hard – Anita supported by bottom of the diamond and POM Jade Blanchflower – a returning dragon – worked tirelessly up and down the pitch. Manning the wide midfield roles – Jane Wells, Mia McGhee and Gill Walker made some great interceptions to turn over possession, following this up with precise passing to create some great chances. Of the 3 first half goals – scored by Mia McGhee, Jemima Dorman and Gemma Ballard – dragons will take much promise from their short corner performances. Something worked on in training this week with Mike and Shelly dragons were organised in the attack. Amy Forse taking the strike and calling loud and clear for post Mia ran from the injecting spot to deflect the ball goal ward. Going into the break at 3-1 – having conceded a goal to a well rehearsed short corner – Jason’s words of advice on meeting the ball and protecting the castle were taken on board. The second half so Herlings dig deep – the defence team of Kate Atkins, Hannah Woods and Amelia Smith supported by Beth Elgood remained strong – channelling the play out wide and clearing their line accurately – they frustrated the attack of Herlings. Tilly Connors-Beckett made some brilliant clearances from goal. Knowing they are dangerous in set play – a string of short corners were clearing, but Herlings finally made their break through to score a second. This was not enough however, with Dragons adding another 2 in the second half. One of which would be a contender for goal of the season! With Harriet making a great run into the D and getting off a strong strike at goal, the keeper saved it, for it to land on the stick of Jemima Dorman – who managed to find an angle to flick it into the top left corner. Ladies 8s donut of the day – Jo Baker for forgetting the first aid kit! It’s on days like this that we realise why we play hockey in the cold and the rain! It was a SCORCHER (well 21 degrees is hot for the UK)! From the outset of the match it was obvious that the #SuperSevens meant business and are gunning for promotion, future opponents beware! This may have surprised a few members of the #awesomeeights but once settled came back fighting. This “friendly” first match of the season marked many debuts for the 8’s team. Emma North made a confident league match debut in the goal keepers kit and made some awesome saves earning her a scattering of POM nominations. Sadie Jacobs was another debutant player giving a confident start as left forward and proved to be a natural at annoying the oppositions defence! A few returning players stuck to their preferred positions providing a stable foundation to the team. Johanne Steward showed off new skills learnt over the summer which went a long way to keeping the attacking 7s at bay, especially as she had the forceful Addy Kraemer to contend with. Esme McKinnon-Evans and Jess Lockwood both served as left back during the match and providing some pace and long hits down the line. Centre defender and vice-captain Jo Baker provided a plethora of her awesome signature “slap-hit” clearances (just as she has been practising in training) out of the D to the wings and on a couple occasions the waiting forwards. Jo was ably assisted by Tracy who has proved to be the perfect choice for bottom of the diamond with her speed and feisty attacking nature. Dani Winteringham and Nic Harrison provided pace to the wings, with Dani also providing cover for top of the diamond which she is well suited to with her keen eye and good passes. Nic’s confidence grows with every match she plays and is a great personality in the team! Right forward Shaniece Claxton is another who’s confidence has increased considerably and is one to watch out for as the season progresses. Ultra-experienced (Sorry Lois but someone had to take over the oracle title from Bridge) centre forward Lois Metcalfe provided a perfect example of being able to find spaces and communicate brilliantly whilst keeping her eye on the ball. Last but by no means least, Captain Katy Cole moved into the top of the diamond position following feedback from last season where she could show off her gazelle like running skills and easily ran between the opposition and drove the ball up the wings to the waiting forwards. Yes the score line is a bit dismal, yes the team need to gel and trust each other more, yes it is the beginning of the season and there have been many changes to the team and that in itself has wobbled a few players BUT there are so many positives to take from the match and some bits to take forward into the next match! Namely identifying your opposite player and mark them to the end, communicate more; yes Katy, Jo and Lois can shout until they are blue in the face but we would give ourselves a more enjoyable match and intimidate the opposition quicker if we all did it! Lastly, REMEMBER we are awesome and we will prove it, watch this space as we are coming back fighting! 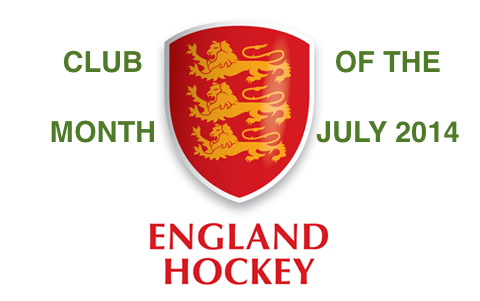 Norwich Dragons Men’s 1s got the new season off to a solid start with a 1-1 away draw at Peterborough. The long trip, a mixed pre-season and several changes to last year’s strong side made the Dragons’ early dominance especially impressive, with the home side pressured into conceding possession and a number of early chances. However, it was Peterborough who scored first, with a long ball forward finding their lone striker to finish clinically. Shortly afterwards Peterborough had a great chance to double their lead with a similar through ball, only to be thwarted by a last-ditch touch from the outstretched Peter Dickerson. In spite of these chances, the Dragons continued to dominate possession and territory, with the right post twice coming to Peterborough’s rescue. Half-time oranges inspired the Dragons to step up their midfield dominance in the second half, with the pressure eventually rewarded after man-of-the-match Lewis Wilkins’ cross was deflected in by Patrick Gordon. A subsequent long discussion by the umpires that caused some anxiety, only to transpire that one was injured and needed to be replaced! Thankfully the following game’s umpire was able to stand in, as the Dragons pressed for a win. In spite of a number of short corners, several great saves from the home keeper and a third intervention from the right post, the Dragons were left to settle for a draw. The Dragons are likely to have tougher games during the season, but this was a solid start with plenty to build on. Richard Moulson celebrated his first league game as Mens 2nd’s captain with a 5-1 win against Bury st Edmunds 2nds at the den. Tom Vaughan got his bid for the golden stick off to a flyer with a first half hat trick (the second a contested own goal – but hey, he’s claiming it!). The bare eleven dragons kept Bury at bay – restricting them to a solitary short corner (HT 3-0). Unfortunately for dragons additional opposition players kept appearing in dribs and drabs – bringing their number up to 14 – while the home teams only sub was conspicuous by his absence. A further two goals: another for Tom and a well taken reaction strike from Max Laming made it 5-0. Unfortunately a lack of subs and tiring legs enabled Bury to score a consolation goal. Stalwart work in the midfield engine by Richard Moulson, George B Walker, Max Laming and Jack O’Meara with Tom upfront ably backed by Jason Wolfe. The defence of Simmo, now not-so-stout Hipper, Glenn and Ali Smyth were largely untroubled. Unsurprisingly MOM went to Tom. Bring on the 3rds for next weeks club derby. Dragons kicked off their new season with a tough trip to Newmarket, last season’s third placed team. The focussed warm up, as traditionally practised by the 3s was essential, but was thwarted by an injury in the match before which required flashing blue lights and an hours delay. Boy band member and part time medic Jenkins was poised should his skills (synchronised dancing, tight vocal harmonies) be required. In the intervening hour, many topics were discussed including Pedro’s wonder goal from last week, the relative merits of brewdog versus a decent pint of mild, frozen prawns and the ineptitude of the local motorcycle school. Some of the more mature members of the team felt the need for an afternoon snooze in the bright sunshine. Finally playing hockey came as an unwanted interruption to our japes and it was no surprise that Dragons conceded two goals in the opening 5 minutes. Indeed such was Dragons’ lack of focus, that both goals (no matter what FIH say) were own goals with particular mention going to Dennis’ cracking back foot drive through the covers leaving McLean with no chance in the slip cordon. A third shortly followed from a short corner. Let’s hope PC Gordon Brown is better at protecting your house than he is the post. Stung into action and with some strong words being said, a few of them potentially constructive, the midfield and defence began to get themselves back into shape (as a team, it would be pushing it to say individually we’re in shape). Dragons began to build some attacks and put pressure on the Newmarket defence, with Josh Wiggins being a particularly good outlet with his skills and pace. A good spell of pressure saw Jenkins score after good work by Rob Goodson, and although Newmarket scored a breakaway goal, another goal from a tight angle from Jenkins saw Dragons in the ascendancy. Dragons had several more chances before the half time whistle with the Newmarket goalkeeper making good saves from Jon Goodson and John Ives. After a cracking first half of hockey from both teams, the second half was more of a war of attrition. Dragons worked exceptionally hard and largely nullified Newmarket’s attacks with special mentions for Jim Goodson, Andy Carver, Joel Dennis and Piers Gordon Brown in defence. The umpires clearly took pity on the hard working Dragons and gave several of the team a few minutes rest at the side of the pitch, which was very much appreciated. Although Dragons threatened several times on the break, Newmarket scored a quality 5th goal to put the match to bed. Final score 5-2. Newmarket undoubtedly will be one of the best teams in the league and the Dragons were really pleased with how they responded to their slow start, worked for each other and kept their shape. Unanimous man of the match was Josh Wiggins in his first league game for the 3s, who was a constant thorn in the side of the Newmarket defence. However we all decided he is in no way ready for the higher teams, no siree, and needs to play with us for a while yet (at least for next week’s derby fixture). Honourable mentions to Paul and Pedro who performed brilliantly against tough opposition. At the post match debrief which is identified out slow start as a major failing, Kate Atkins kindly volunteered to lead the team’s pre match warm up – potentially a step routine to Whigfield’s Saturday night – a sight guaranteed to put the 2s on the psychological back foot from the beginning. Following promotion last season, Dragons 5’s entered the unknown of a new league. The team featured 3 players making their Dragons debuts, Lloyd Wade, Dan Osbourne & Greg Reynolds. Bury were generally faster & more switched on leading to them dominating long periods. Thanks to Man of the Match Chris Millar the score remained at 1-0 until very late on before Bury ran out winners 5-0. This entry was posted in Latest News on September 25, 2017 by Comms Manager.